Founded in 1891, the New Haven Lawn Club is a premier Connecticut wedding venue. It is a classic setting for a wedding and the club’s gorgeous ballroom can accommodate both ceremonies and receptions with up to 200 guests. New Haven Lawn Club Wedding Photos can be taken in the ballroom, throughout the grounds, or at nearby Yale University. This spring wedding was a perfect fit for the club’s scenery. The bride and groom did not stop smiling for the entirety of the day and their joy was contagious. In the picture above, the couple holds hands as they walk past family and friends who witnessed them make their vows. The ceremony took place in the simple beauty of the club’s ballroom. As is seen in the image, a large fireplace lined with candles served as a centerpiece behind the bride and groom as they said their “I do's”. The room is not lavishly decorated, with neutral colored walls and drapes. The jewel of the ballroom is the uniquely designed crystal chandeliers that hang above the wedding celebrations. These chandeliers, wall lights, fireplace candles, and other candles placed on tables during the wedding reception, give the room an ambiance that can be altered to the personal taste of the bride and groom. It also gives the couple unlimited options when considering their bridal party colors. 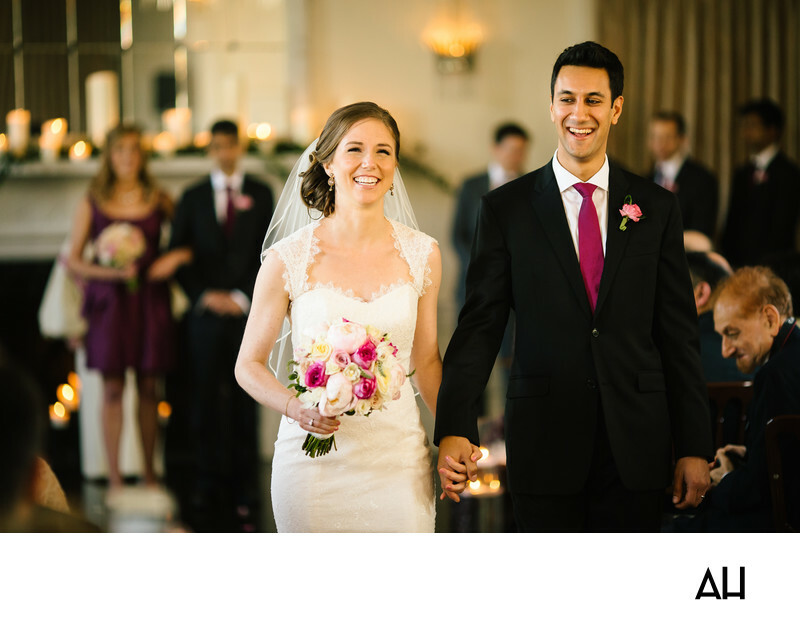 This bride and groom chose deep shades of pink and purple, offsetting the neutrality of the ballroom’s interior. What makes this picture so special, however, is not the room the wedding was held in -- it is the bride and groom themselves.